SKU: WS228. Categories: Man Cave Signs, Novelty Signs. 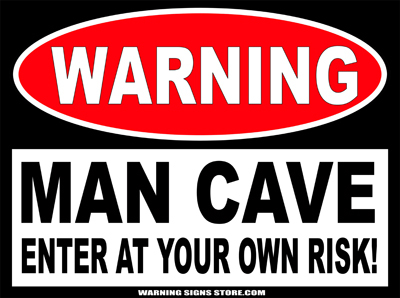 Tags: Man Cave Enter at Your Own Risk, Warning Sign. The Man Cave is not the place for OSHA and ANSI. You won’t see Safety Signs. You won’t see Caution and Precaution signs. What you’ll see is Man Cave Stuff. Therefore, make it known at the door, “He Who Enters Here Enters At His (or Her) Own Risk” with our tongue-in-cheek Man Cave Adhesive Sticker. Also makes a great gift for the man in your life! This sign measures out to approximately 4.5″x6″. It is printed in a glossy finish with eco-friendly inks on an adhesive-backed premium vinyl polymer. Our inks are UV resistant and designed to last 7-10 years, indoors or out.